We know the home buying process can be intimidating. That’s why Jacobsen Homes strives to assist you throughout the process, in an efficient and professional manner. Our manufactured home experts are standing by to answer your questions regarding building a new home. Need more information on the home buying process? We are here to help. Looking for mobile home info in Florida? We know the areas and the regulations. We invite you to experience the Jacobsen Homes difference first hand. Tour Jacobsen Homes manufactured homes at one of our many model centers and/or communities across Florida. 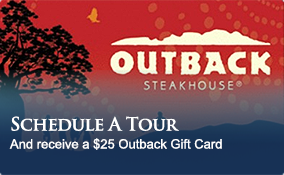 Schedule your tour ahead of time through our form below and you will receive a $25 Outback Steakhouse Gift Card, redeemable at any Outback, Bonefish, or Carrabba's restaurant. To schedule a model home tour in Florida, simply complete the form below.